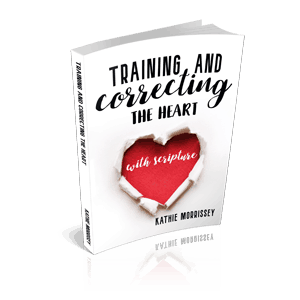 Training & Correcting the Heart With Scripture is designed to make it simple for parents to use God’s Word for reproof, correction, and training in righteousness. If you’re tired of scolding and want effective correction that focuses on changing your child’s heart, use Scripture. God’s Word is more powerful than our words, and brings conviction that our words can’t bring. The book includes is a Bible study of 21 character qualities, including the Bible commands concerning them, the negative consequences of them, and the positive consequences of following God’s way instead. The information provided in this set is given to help parents make the most of each opportunity they have to train their children “in righteousness”, using His Word. Training & Correcting the Heart With Scripture is designed to make it simple for parents to use God’s Word for reproof, correction, and training in righteousness. Included is a Bible study of 21 character qualities, including the Bible commands concerning them, the negative consequences of them, and the positive consequences of following God’s way instead. The information provided in this set is given to help parents make the most of each opportunity they have to train their children “in righteousness”, using His Word. Included in this section are worksheets for 21 different behaviors. 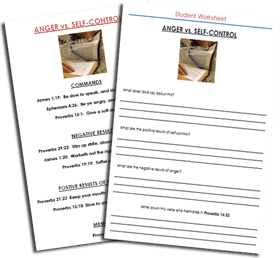 Below are examples from the lesson on Anger vs. Self-control. What does God say about this (anger)? What are negative results of (anger)? What are the positive results of (self-control)? 1.) The parent goes through the guide sheet with the child, they look the verses up together, and the student fills in his worksheet as they go through the guide sheet. 2.) The parent gives the guide sheet to the child, has him look up the verses on his own, and then fill in the worksheet based on personal experience from the situation. Parents only need to purchase one ebook, and can then make additional copies as needed for the same topic, or for additional kids. This section includes 17 Behaviors we often deal with when raising our children, and a list of references for verses that can be used to correct and train them in these areas. God’s Word relates in a practical way to our kids’ lives, and is the best tool for reaching their heart. This is an excellent resource that will easily enable parents to use God’s Word for correction and training throughout each day, and make the most of those training/correcting opportunities when they arise! I love this example of discipline. I can see how it will change the hearts of our children. Thanks.